Determining the correct procedure code to submit for a particular molecular pathology/genetic determination can be very difficult. The CPT® contains numerous listings of molecular pathology/genetic test codes, however finding the procedure code that describes a particular test amongst Level 1, Level 2, and other groupings of codes is challenging and time-consuming. 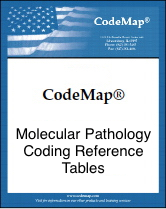 That is why CodeMap® developed the Molecular Pathology Coding Reference Tables This compilation of easy-to-use, straight forward Coding Reference Tables list most molecular pathology/genetic tests along with the correct procedure code (CPT/HCPCS). If you Know the Gene Abbreviation: One Coding Reference Table lists all gene abbreviations alphabetically along with the corresponding procedure codes. If you Know the Disease State: Another Coding Reference Table lists many disease states along with the associated molecular pathology/genetic determinations and corresponding procedure codes. If you Know the Organism: The Manual includes a Coding Reference Table that connects organisms to associated molecular pathology/genetic determinations and corresponding procedure codes. ​This Manual also includes Coding Reference Tables concerning Genomic Sequencing Procedures (GSPs), Molecular Human Leukocyte Antigen (HLA) Typing, Molecular Multi-Analyte Assays with Algorithmic Analyses (MAAAs), and many more. CodeMap® is a Registered Trademark of Wheaton Partners, LLC.